Note: If you use a work or school account to sign in to Office 365, you're using Outlook on the web. If you're using an Outlook.com, Hotmail, Live, or MSN account, see Use inbox rules in Outlook.com. Select Mail, which opens the Options panel on the left. Under Mail > Automatic processing, select Inbox and sweep rules. Select Add under Inbox rules. 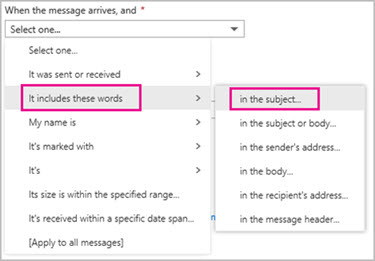 Type a name for the inbox rule in the Name box and then select a condition and action from their respective drop-down lists. You can add additional conditions or actions by selecting Add condition or Add action. Add exceptions to the inbox rule by selecting Add exception and then choosing one from the Add exception menu. By default, the Stop processing more rules option is turned on. 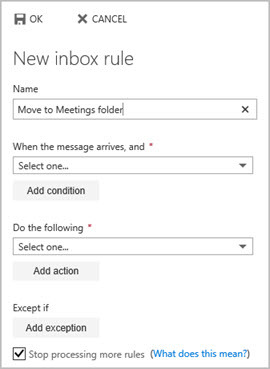 With this option on, when a message arrives in your inbox that meets the criteria for more than one rule, only the first rule will be applied. If you don't select this check box, all inbox rules that a message meets the criteria for will be applied. You can edit any inbox rule by selecting it and choosing Edit to open the rule so that you can change the conditions or actions of the rule. If you have an inbox rule that you no longer want, you can select it and then select Delete to remove it. If you just want to turn the rule off for a while, remove the check mark next to the rule. Under Inbox rules, select the rule you want to move and then select the up arrow or down arrow to place the rule where you want it positioned within the list of rules. Type a name for the inbox rule in the Name box. Under When the message arrives, and, select It includes these words, and then select in the subject. 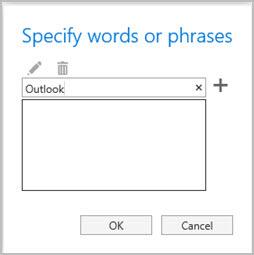 Specify a word or phrase that would be in the subject line of the message to move, select Add , and then select OK. Under Do the following, select Move, copy, or delete, and then select Move the message to folder. Select the folder to move the messages to and select OK. Select OK at the top of the dialog box.